 Hey all im new to these forums. 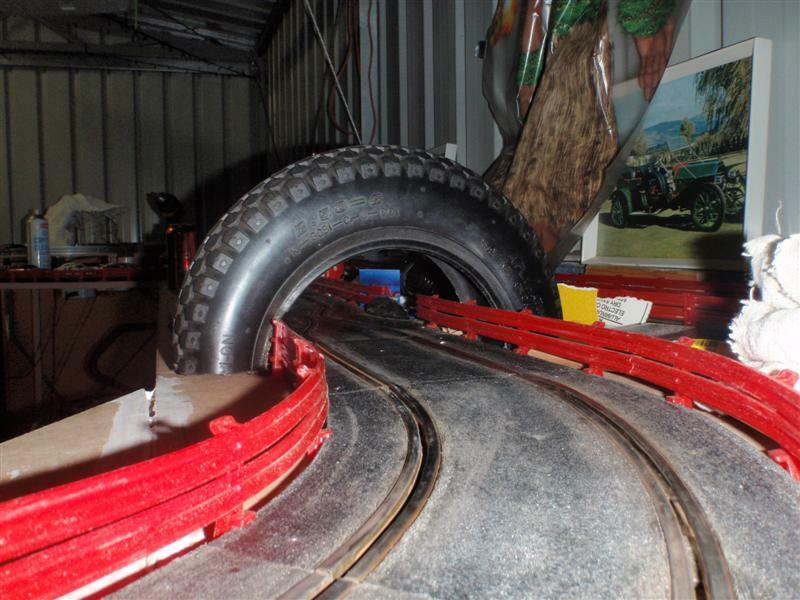 have started building a track in the back shed. 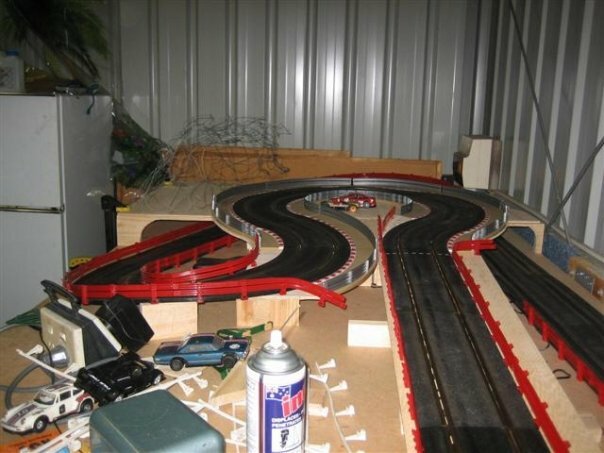 Just your basic old scalextric set nothing fancy. Most of this track is about 30 years old. i have got it setup with a separate transformer for each lane. with power being supplied at 3 locations. its mounted on hinges on the wall so it can fold down out of the way. 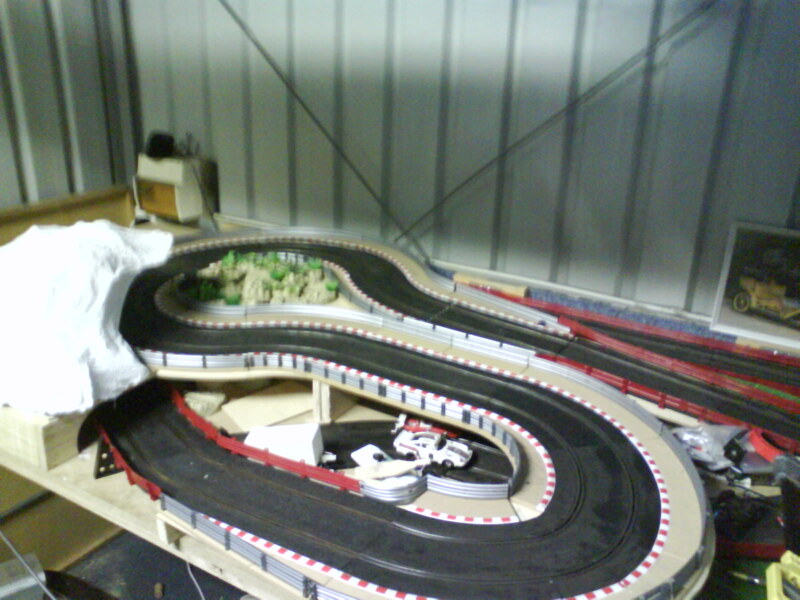 the track is still getting tweaked a little but i think this is how the final design will be. 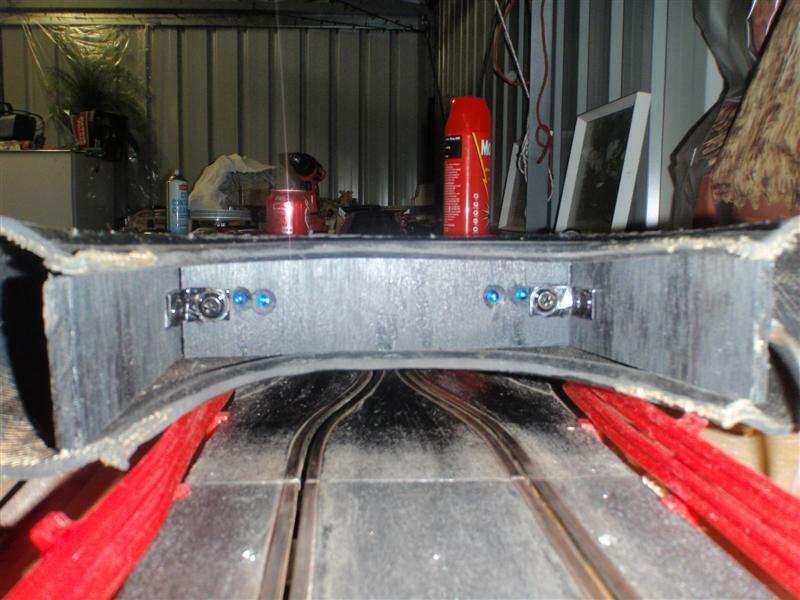 currently building an IR lap counting system and plan to copper tape the track when i find where to get the stuff. only got a couple of cars atm but will build the collection. now just planning on how i'm going to do the scenery. 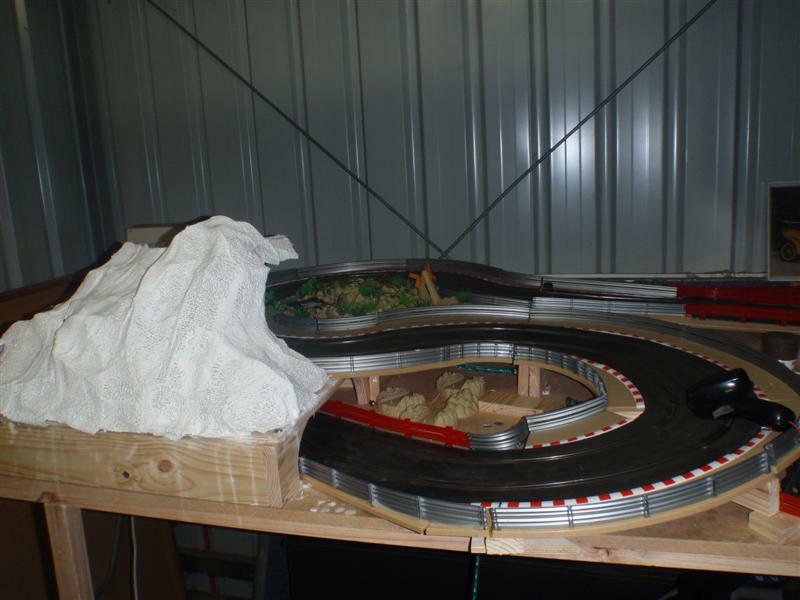 as can be seen in the last picture ( the wire) im planning on building a mountain on the top with an overhang over the track. 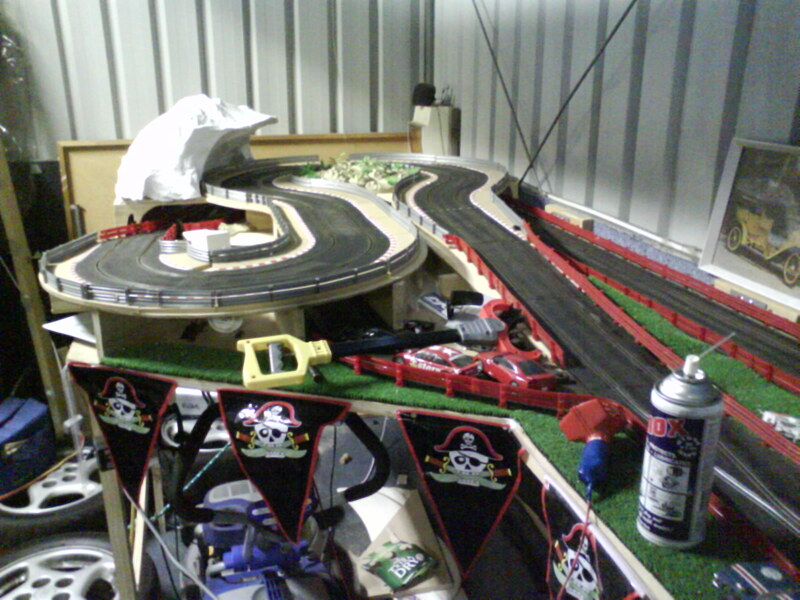 That is an awsome use of space and the track layout in my opinion would be great to run on. Nice long straights and it looks as though you dont have any R1 turns which in my opinion makes for better racing and less offs. Others may know of other suppliers (or local suppliers). Just make sure you clean all the wd40 off with alcohol or similar before you apply the tape. 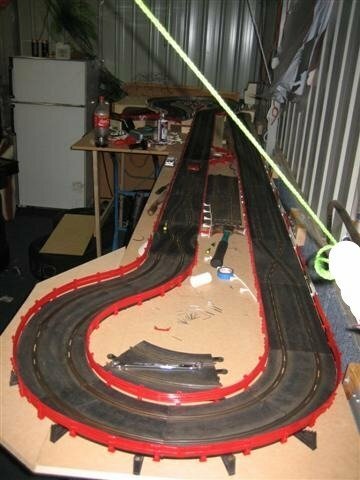 My brothers and my first track started out using 30 year old scalextric track. It works as good as any! Welcome. Congrats on the track. Nice to see someone else still running the plastic fantastic. Looks like a fun and fast track. Particularly like the mountain end. Only concern for me would be the Xovers. Depends on the style of racing, but they do promote carnage. You might want to look at moving the one that goes under the mountain. Cars deslot there it looks like it might take some hard work to get them back. the only bad part of the track is the banked corner i have behind the hill if your not going full speed can cause problems on very low cars... so might need to buy some new banked corners or redesign that end. 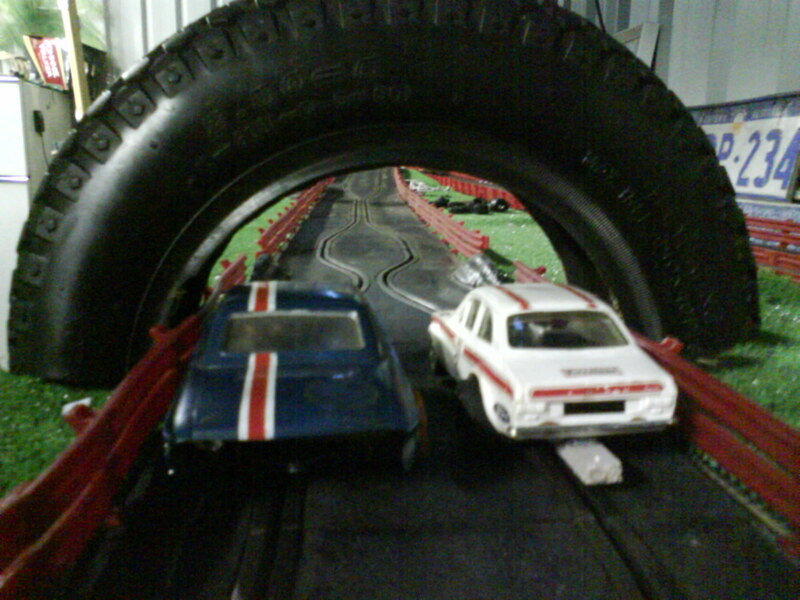 the tunnel is deceptive i only have the tunnel openings on 1 end the back end is completely open so makes it very easy to get cars if they crash... and unfortunately to keep the track even need to have the crossover there. 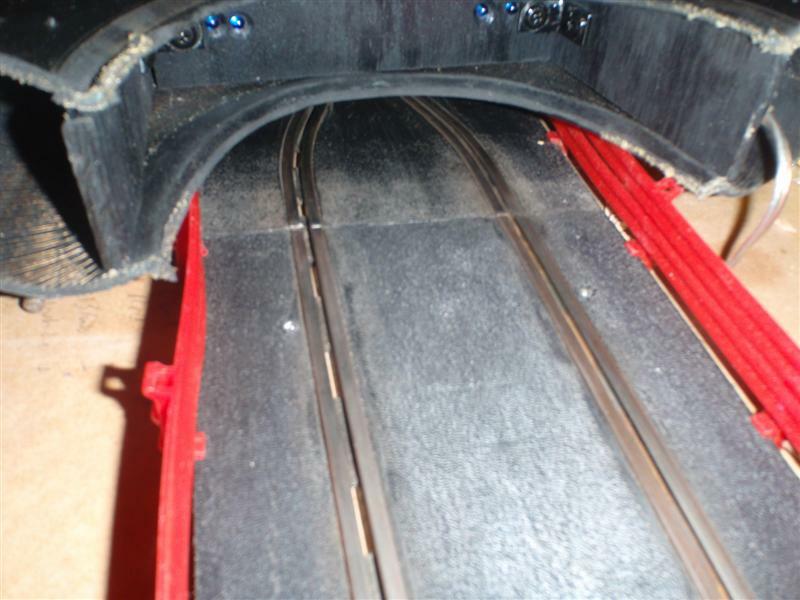 and yes its a very fast track coming under the tunnel full speed into a banked corner then into about a 5m straight the cars get a hell of a lot of speed then into a crossover sometimes gets messy. i might need to build a catch net at the end to stop from breaking cars as they go flying. thanks for the info on the copper tape. what size did you guys use ? the wife calls my shed the man cave :-) a place where i disappear for hours. after a bit of thought i got rid of the banked corner. get a lot less de-slots now much more enjoyable. 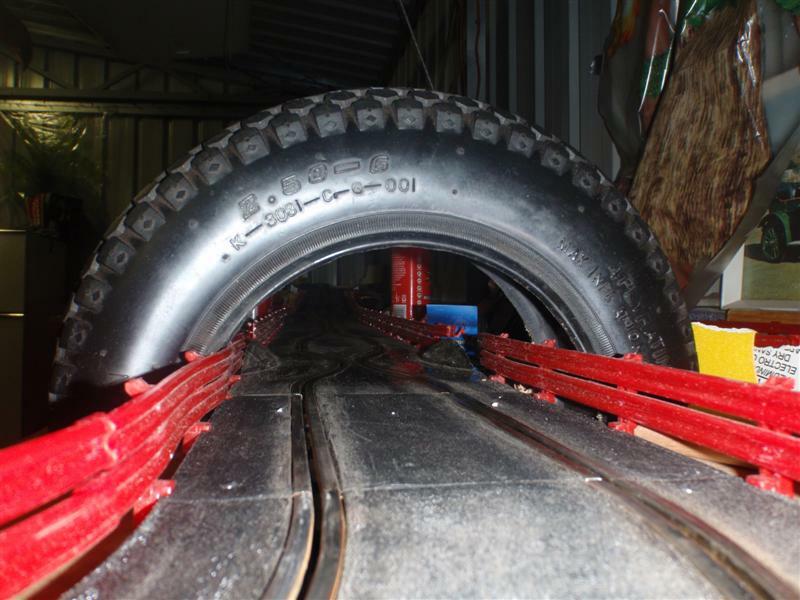 dont know if you guys have ever seen it i though of a good idea to make a bridge over the track like the big Bridgestone tyre. bought a wheel barrow wheel and cut it in half. im going to use it for the infrared timing lights. 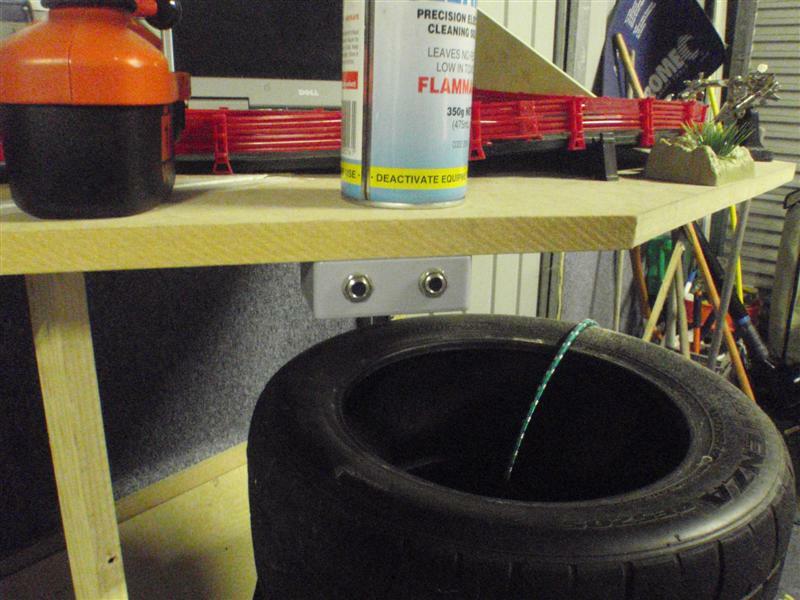 the tyre bridge also contains the IR leds for the lap counting system when i finish it. Anyway it's nice to see some more tracks in Perth especially... good stuff! 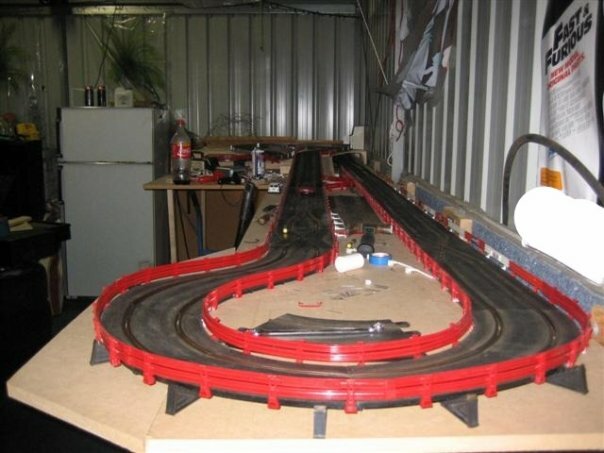 Looks good mate, when our rabbits cark it, I've got permission to use that space for a slot car track/room, and I'm already envisaging a mirror image of this design (as the space is long, but not so wide). 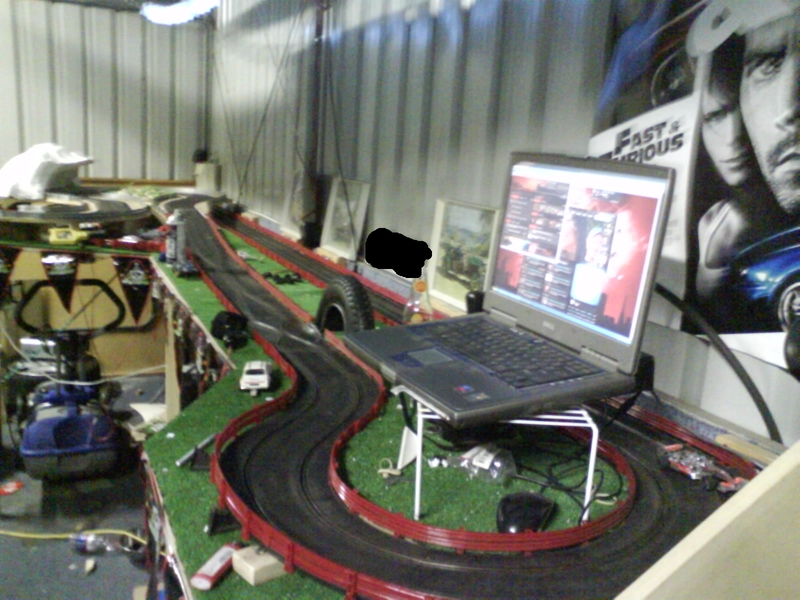 got the timing system working tonight.... so much better now i can see lap times improving. ended up going with the ultimate racer timing software. works well and is easy to setup... the guide in the workshop section made it a breeze. Hey been a while since i updated. ive put grass down in most areas. extended the mountain a little bit. now the R1 curve is flat rather than part of the downward curve.. a lot less de-slots now. so i made her a little podium to stand on when playing. couple of milk crates a wooden frame and a bag of cement to keep it sturdy. it passed the wife's safety testing so all good. Scalex Classic responds well to being nailed or even glued down if you cut off the locking tabs, push them together, then nail/screw/glue or whatever to the table top. 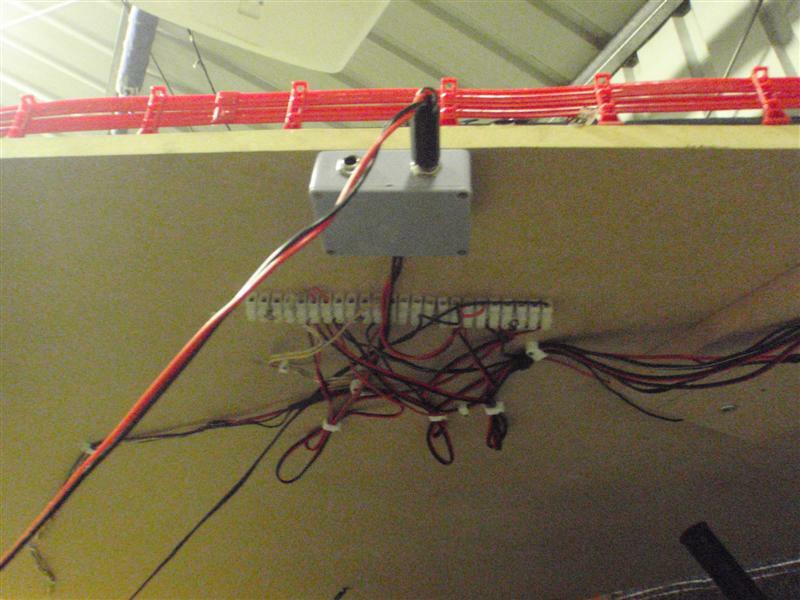 It works even better if you solder wire jumpers to each electrical connection underneath before gluing down. Even beter if you can get some MIB or new old stock before you start. 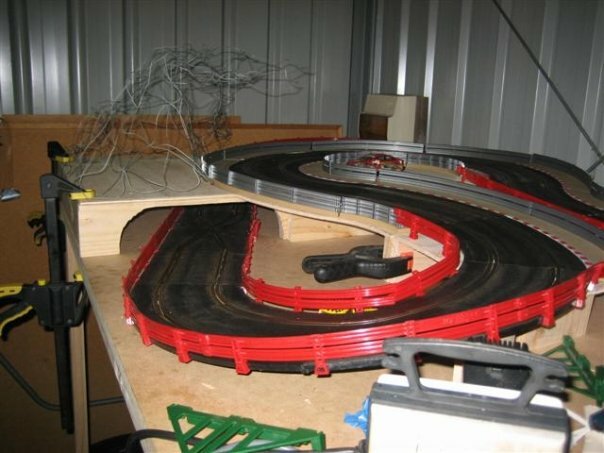 This IMHO is the best plastic track ever made if handled correctly from new. 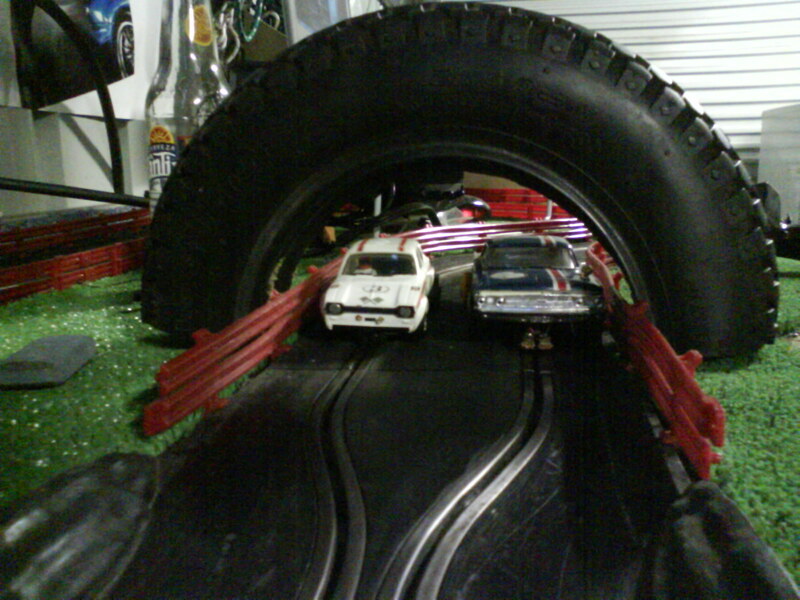 i ended up using a battery staple gun to attach the track. 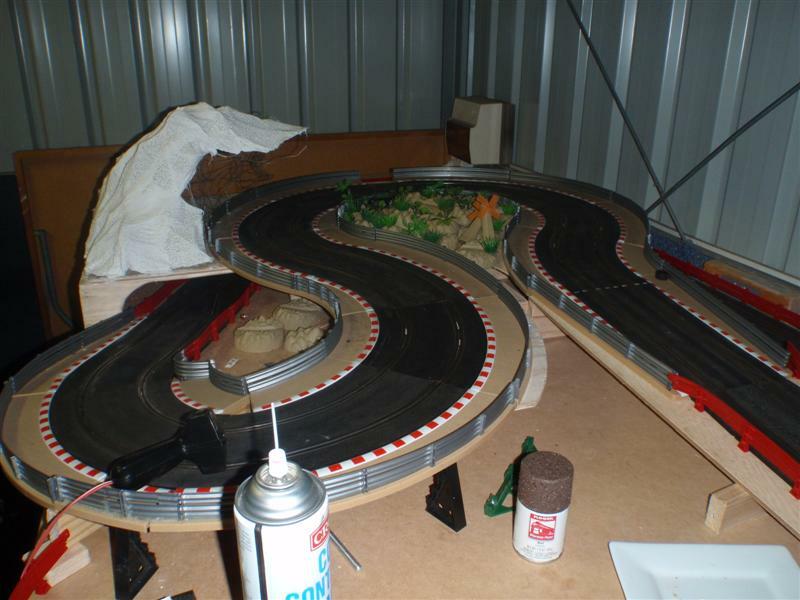 holds it down firm without making indents in the track.